The exhibition is accompanied by a special publication compiled by the three curators of the exhibition Leontine Coelewij, Kerryn Greenberg and Theodora Vischer. 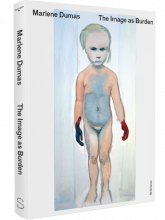 Structured along a strict chronology, the publication traces developments in the oeuvre of Marlene Dumas from the 1970s to the present day. The 196-page catalogue also contains writings by the artist, a number of new texts, short existing texts and interviews, and some 200 illustrations. The publication is designed by Dutch designer Roger Willems and published by Tate Publishing. The catalogue is available in the museum shop in Dutch and English.